Going to college is a stressful time for my parents, even though they are not the ones going. I recognize that neurosis is beyond anyone's control. Each week, I will calmly reassure them that I am working on my essays, have registered for my tests, am finishing my applications, have scheduled my interviews, am aware of all deadlines, and will have everything done in plenty of time. I will smile good-naturedly as my parent asks four follow-up questions at College Night. I will try not to say "no" simply because my parents say "yes," and remain open to the possibility, however improbable, that they may have a point. I may not be fully conscious of my anxieties about the college search - the fear of being judged and the fear of leaving home are both strong. I don't really want to get out of here as much as I say I do, and it is easier to put off thinking about the college search than to get it done. My parents are right about the importance of being proactive, even if they do get carried away. Though the college search belongs to me, I will listen to my parents. They know me better than anyone else, and they are the ones who will pay most of the bills. Their ideas about what will be best for me are based on years of experience in the real world. I will seriously consider what they say as I form my own opinions. I must take charge of the college search. If I do, the nagging will stop, and everyone's anxiety will go down. My parents have given me a remarkable gift - the ability to think and do for myself. I know I can do it with a little help from Mom and Dad. 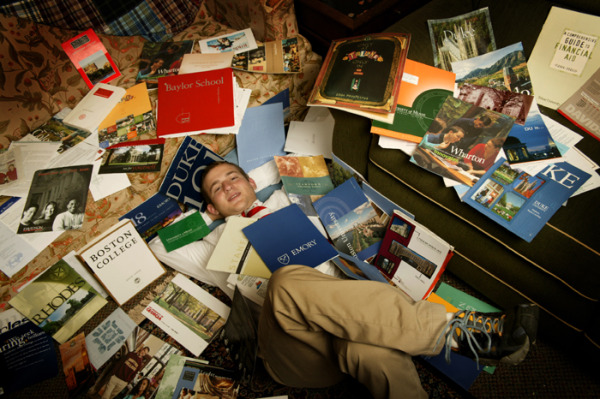 I am resigned to the fact that my child's college search will end in disaster. I am serene. Deadlines will be missed and scholarships will be lost as my child lounges under pulsating headphones or stares transfixed at a Game Cube. I am a parent and I know nothing. I am serene. Confronted with endless procrastination, my impulse it to take control - to register for tests, plan visits, schedule interviews, and get applications. And yet I know that everything will be fine if I can summon the fortitude to relax. My child is smart, capable, and perhaps a little too accustomed to me jumping in and fixing things. I will hold back. I will drop hints and encourage, then back off. I will facilitate rather than dominate. The college search won't happen on my schedule, but it will happen. I will not get too high or low about any facet of the college search. By doing so, I give it more importance than it really has. My child's self-worth may already be too wrapped up in getting an acceptance letter. I will attempt to lessen the fear rather than heighten it. I will try not to say "no" simply because my son or daughter says "yes," and remain open to the possibility, however improbable, that my child has the most important things under control. I understand that my anxiety comes partly from a sense of impending loss. I can feel my child slipping away. Sometimes I hold on too tightly or let social acceptability cloud the issue of what is best. I realize that my child is almost ready to go and that a little rebellion at this time of life can be a good thing. I will respect and encourage independence, even if some of it is expressed as resentment toward me. I will make suggestions with care and try to avoid unnecessary confrontation. I must help my son or daughter take charge of the college search. I will try to support without smothering, encourage without annoying, and consult without controlling. The college search is too big to be handled alone - I will be there every step of the way.